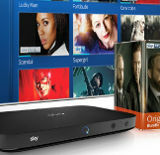 Promotional codes and discounts to make savings on home TV, broadband and phone services at sky.com. Sky Digital is watched and loved by millions of viewers across the UK with hundreds of channels available covering sports, drama, movies, comedy and more. Sky comes as a complete package with great value phone and broadband services as well as on demand and Sky go add-on. Terms and Conditions: £75 Choice of reward: Tesco or M&S e-Voucher or Prepaid MasterCard®: Availability subject to stock. Prepaid MasterCard® can be used wherever MasterCard® is accepted, except for gambling, cash withdrawals, currency, cashback or at petrol stations. Unused card values will expire 12 months after the cards are printed. To receive the Tesco or M&S e-Vouchers you need a valid email address and the ability to print. Not available with any other Sky TV offer. Tesco, M&S and MasterCard® further terms apply. 18 month minimum contract and add Sky Fibre for £20 a month. Plus £59.95 one off setup fee. Sky (formally known as Sky Digital) is a company run by BSkyB’s digital satellite T.V and radio broadcasting service. It all began in 1990 when Sky Television plc and British Satellite Broadcasting encrypted their film channels. Customers could buy both channels using decoding equipment and paying for a subscription. Three years later BSkyB launched it Sky Multi-channels package. Customers could then not only access Sky’s channels but also additional channels from third parties. The company was officially launched as Sky Digital in 1998, they emphasized the vast improvement of picture and sound quality over their analogue service. Another of Sky’s unique selling points was the exclusive access to channels and programs that were only available on their digital format. Since the beginnings of digital television, Sky has launched its HDTV service. This was introduced in 2006 and saw over 40,000 subscribers in the week pre-launch. Unfortunately they did see a few glitches during the launch with a large number of subscribers being unable to access the service. In the beginning, users would receive a Sky Digibox in order to receive satellite viewing. In later years they have launched their Sky+ and Sky+HD boxes and now SkyQ. These allow users to pause and rewind programs while live and have multi-room, wire free TV. In addition customers can record programs for future viewing. One of Sky’s biggest selling features has to be their Sky Movies package. This gives viewers the chance to see newly released films before they are available to buy. Sky has recently launched its Sky Go service. This gives subscribers the chance to view some of sky’s channels on mobile devices and via the internet. This has been important to ensure the company stays in the marketplace for digital entertainment. Check our live page here at deliverycode.co.uk for all the latest Sky exclusive deals and all the beat Sky savings. We list all the live offers as we get them so keep checking the most recent posts featured above this article. All the expired Sky savings are listed below, some may have been extended so it may be worth checking them out it doesn’t cost anything.